The #1 selling Auto Ramp in the automotive industry! The complete " Do it yourself " car and truck ramps. Retail across the country - Wholesale available. The #1 Manufacturer for the DO IT YOURSELF AUTO RAMPS CHOCKS and More. We are Raising the Standard of Quality-Made in the USA. In the economy today, every little bit helps and we at Autoramps.com / Petersen Tru Cut Automotive recognize that and have a solution for the home automotive repairman. Our auto ramps will save you time and money. By using these outstanding ramps you can safely work on your auto and save the stress and strain of using inferior jack stands, cinder blocks or what ever you have used up until now. 'Do it yourself repair man.' Contact a retailer today! 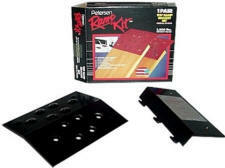 Don't forget to check out our Chocks and the Petersen Tru Cut Ramp Kit.